McCants Stewart was an African-American lawyer originally from New York City, who plied his trade in Minnesota, Oregon, and California at the turn of the last century. After Stewart attained his bachelor and master of law from the University of Minnesota Law School he settled in Portland, Oregon. 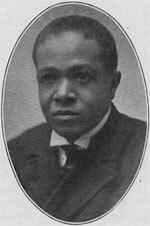 On March 1st, 1904 he gained admittance to the state bar, the first African American to do so in Oregon. In 1905 he was the first African American lawyer to argue a case in front of the Oregon Supreme Court. He also helped found The Advocate, a black newspaper. Though he established a solid record in Portland, with several celebrated cases, he struggled financially. Portland’s black population, from whom he derived most of his business, was not very big. In 1917 he moved to San Francisco, seeking more opportunities.